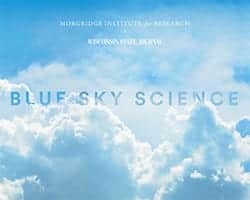 News & Stories > Blue Sky Science > Why is the sky blue? Blue Sky Science: Why is the sky blue? Each color of light has a different kind of wave, from short wavelengths to long wavelengths. For example, blue light has a shorter wavelength than red light. Light from the sun will travel in a straight line until it encounters something like the Earth’s atmosphere, which is made up of billions of tiny molecules of mostly nitrogen and oxygen. Those molecules like to scatter shorter wavelengths more than they like to scatter long wavelengths. So the molecules scatter blue light much more than they scatter red light. When we look up to the sky, we see all the blue light that’s been scattered by the oxygen and nitrogen in our atmosphere. You might be wondering, purple actually has a shorter wavelength than blue does, so why isn’t the sky purple? It turns out much of the purple is scattered out really high in the atmosphere so there’s not much left to reach our eyes. But more importantly, our eyes don’t recognize purple as well as they do blue. Also, the sun’s light has to travel through much more atmosphere when it’s at the horizon (at sunrise and sunset) instead of overhead (during the day). Along the way the blue light is scattered so much that there’s hardly any left. All that’s left over is the red, yellow and orange light, so that’s why we see the red, yellow, and orange light at sunrise and sunset. Why can eye color vary between siblings?